This past week I was reminded how easily household items can be transformed into something beautiful and festive. It goes to show you that you don’t have to spend a fortune on decorations to create the look you’re going for. 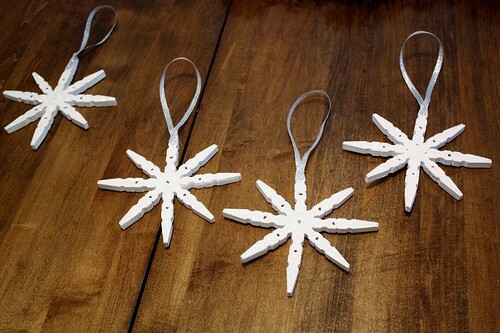 I participated in an Ornament Swap at Tutus and Tea Parties, and after toying around with what ornament to make, I decided to create sparkly clothespin snowflakes, using everyday clothespins and glitter. We haven’t decorated our tree yet, but I used it to test out how the clothespin snowflakes’ glitter sparkled with the twinkle lights. I loved how they caught the light and bounced it all over the room. Not only are they inexpensive, but they are also easy to make. You can even have kids help you with painting them and adding glitter. 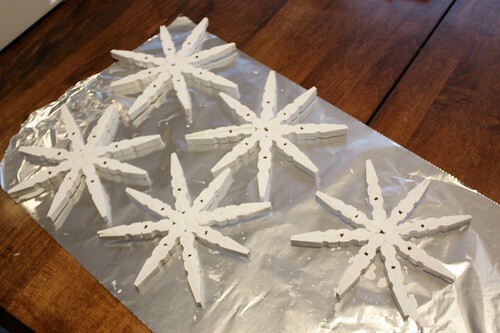 For each snowflake, you’ll need 8 wooden clothespins. I was able to find a 50 pack for $1.98, which would make 6 snowflakes. Take each clothespin and pull it apart, removing the metal spring. 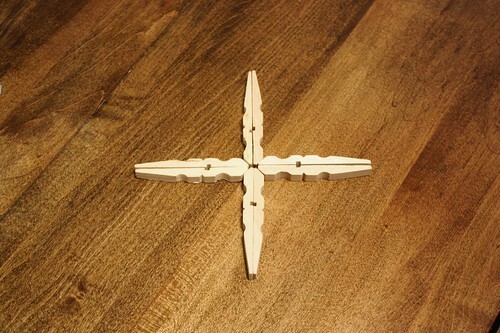 Take the two wooden pieces of the clothespin and put them back-to-back, like the bottom clothespin in the picture above. Glue the two pieces together with craft glue, and then let them dry. 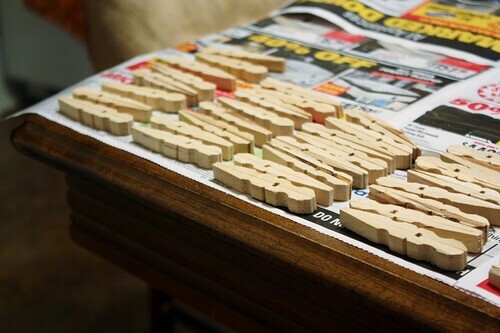 If you want to, you can also sand them a bit after they have dried, to make them smoother. 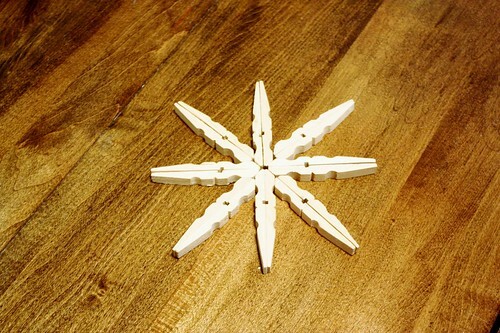 To put the snowflakes together, take 4 of the glued clothespins and glue them together in a plus sign using a hot glue gun. 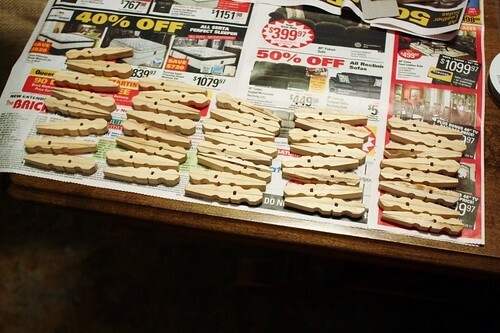 Then added the four remaining clothespins to the spaces between the glued clothespins. Glue in place with hot glue. 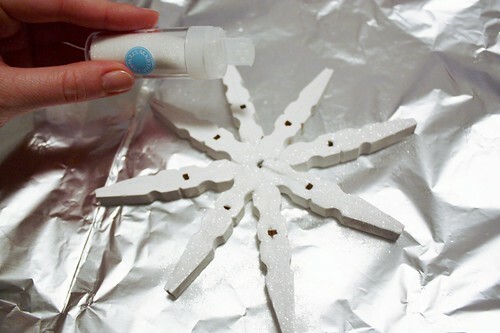 Paint the snowflakes using white acrylic paint and let dry. 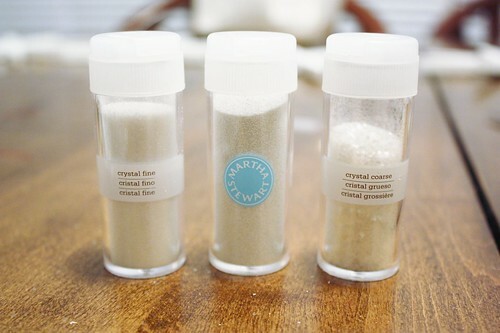 For glitter, I went with Martha Stewart’s crystal fine and crystal coarse white glitters. They were a little more expensive than regular glitter, but the effect they created was perfect, and I only needed to use a little bit. 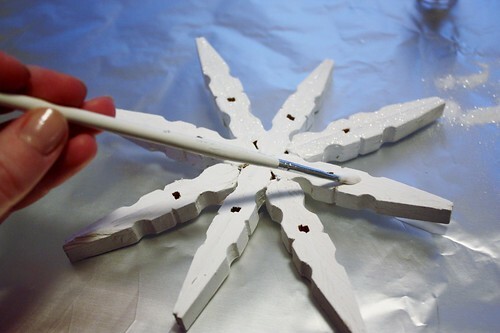 Using a small paint brush, apply craft glue to the front of the snowflake. Sprinkle the glitter all over the glued areas, make sure to thoroughly cover them. 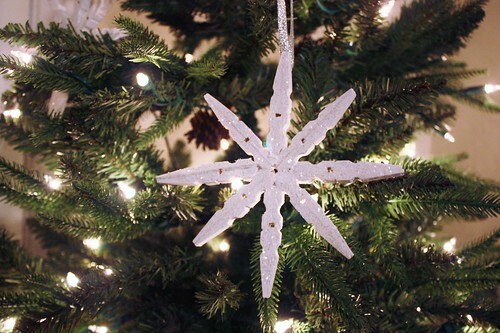 Tilt the snowflake and tap off any excess glitter. I was able to pour this back into the containers afterwards, so there wasn’t much glitter wasted. 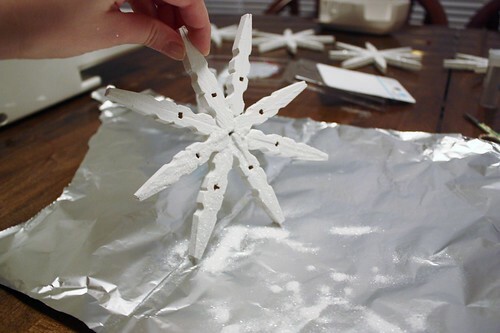 Allow the glue to dry and then flip the snowflake over and complete the process on the other side. 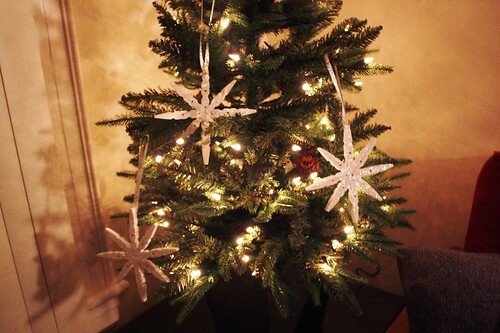 I ended up doing half of the snowflakes with the fine glitter and half with the coarse glitter. I love how they catch the light. After the glitter and glue has dried, take pieces of silver ribbon and make into a loop. 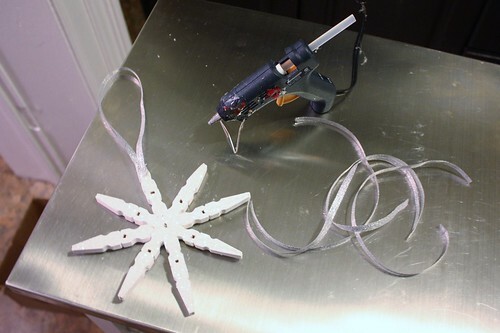 Hot glue onto the top of the snowflakes. Let the hot glue dry and then they’re ready to hang up! 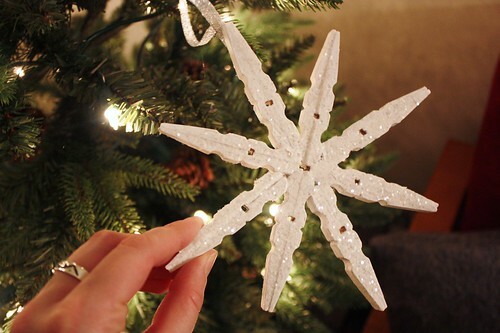 I packaged up the clothespin snowflakes and sent them to my Ornament Exchange partner, Angela, who blogs with her sister at Little PINK Thread. I can`t wait to see what she’s sent me! 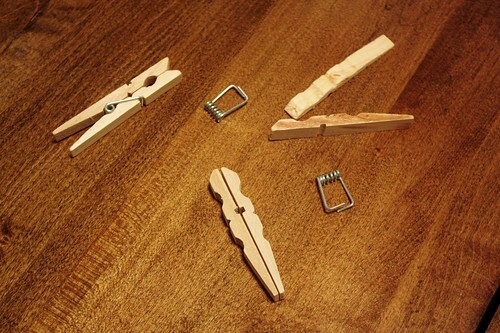 I love that you used clothespins! These look awesome! I have to make some and maybe even use them on gifts this year. So easy, but beautiful! Very cute. 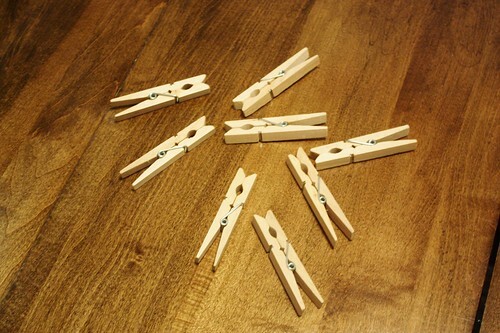 I’m got tons of clothespins laying around. My daughter would love this. Those are so creative and beautiful. Great work! How adorable! 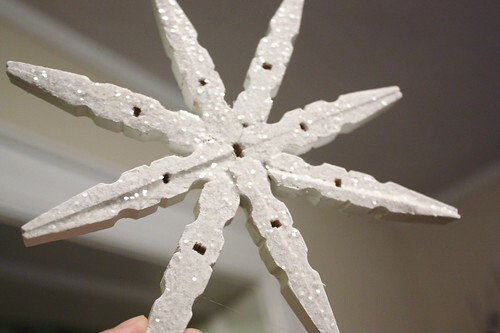 I love these snowflakes, I’m going to pin this so I can make these with the grand-kids. 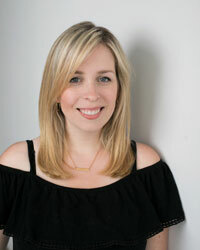 Saw you linking at Inspiration Friday.